Xero HQ is a platform highlighting connected apps like Expensify where accountants can centrally manage all their clients' needs. Companies with Collect or Control policies can integrate Expensify with Xero HQ in just a few clicks! Before connecting to Xero HQ, make sure you are a policy admin for a policy that is connected to Xero. More information on getting connected to Xero can be found here. 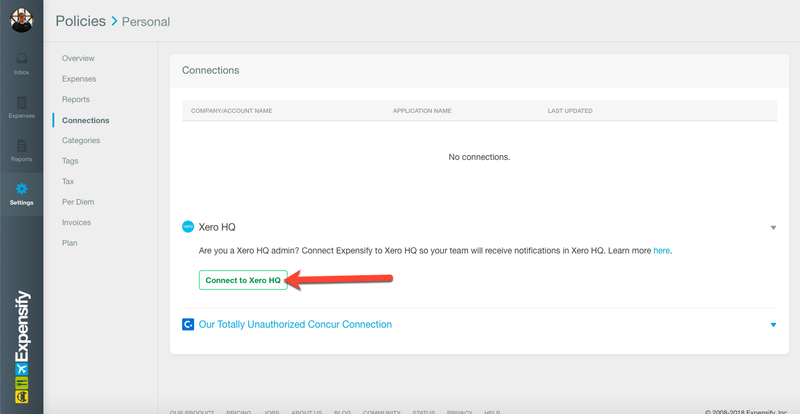 Once this information is confirmed, go to Settings > Policies > Individual > [Policy Name] > Connections and click Xero HQ. Then click Connect to Xero HQ. Enter your credentials for your Xero HQ dashboard. Once connected, Expensify will sync updates to the Xero HQ dashboard. Please note only one policy admin can be connected to Xero HQ at a time within Expensify. The dashboard will provide notifications about reports that need attention. Just click Review in the dashboard, and you'll be transported back to Expensify to view, approve, or reject expense reports. If you have any questions on this feature, reach out to our dedicated Success Team at concierge@expensify.com!